The Benefits of having an industrial vertical storage lift in vertical warehouse and manufacturing spaces. This is also known as the Hanel Lean Lift. Stuff is going up, literally. 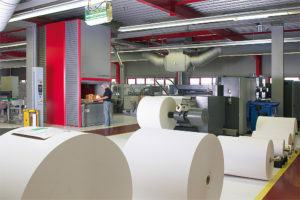 Industries with high volume or high value items are looking for maximum efficiency today. Companies are looking to save, money, time and space. The plan today is to have streamlined operating procedures, more flexibility, and less overhead costs. This warehouse organization system, the Hanel Lean-Lift, reduces time because of the high speed efficiencies and capabilities of a designated person continuously pulling parts, reduces space by allowing a vertical lift to sit in a 10 x 10 type footprint instead of shelving and aisles lined up down the warehouse, and reduces cost by allowing inventory tracking, security so that parts are not lost, stolen or misplaced and the time to pick a part. With Industrial Vertical Storage, space can now be reduced by more than 60%! Using the dead air ceiling height, the VLM (Vertical Lift Module) allows all the vertical space to be utilized. No more bending, climbing, stooping, reaching for the parts, the lift brings the pan to a standing or seated height for reachable access. Think about it this way: Maximum storage capacity and Minimal Footprint. More things can be stored in less space to save time and money. Those are the two biggest triggers you are looking for, right? Comparison to your traditional pallet rack storage that you may have in place. For industrial vertical storage, why the Lean Lift? The lean lift can store all different sized items ranging from nuts &amp; bolts to bulk items like motors. The pans have high capacity for your larger items. The machine automatically places the pan according to the most used items close to the lower opening. The system’s controllers can be used as a stand-alone inventory management system communicating with you when inventory is running low and running reports. Where are they located? Specific Industries? The Lean Lift is often spotted in a manufacturing plant, warehouse operation facility, automotive plant or facility, Car dealership, Distribution Center, Food industry, Industrial facility, Laundry facility, Logistics company, Government facility, Aerospace and defense company, and more. What do people use them for? Tool storage, Parts storage, central storage area, small parts, pallet storage, materials warehouse storage, heavy parts, large and bulky parts, raw material, production parts, spare parts, distribution warehouse storage, etc. We have seen it all! You may be thinking to yourself, what are the advantages of having this Hanel Storage System in my possession? We’ve got all the answers covered for you. High density storage of bulky items like heavy parts, tools, goods, etc. Business Systems and Consultants, Inc headquartered in Birmingham, AL partners with Hanel Storage Systems in Pittsburgh, Pennsylvania for our Lean Lift Solutions. The “Lean Lift” is often referred as a VLM, Vertical Lift Module, Vertical Lift, Industrial Lift, Hanel Lean Lift, Automated Storage and Retrieval System, AS/RS, Automated cabinet, and many more terms. 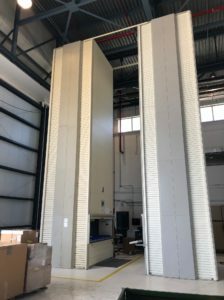 Ask BSC today about a free onsite consultation and storage analysis to see if the vertical lift module is a good fit for your facility or warehouse. BSC offers a turnkey solution including: site surveys/analysis, field measurements, project management, certified installations, service work after the fact, warranty solution offerings, preventative maintenance check-ups annually or biannually, etc. BSC has certified and trained Hanel factory technicians on staff providing you with a clean and safe installation. BSC has a proven track record of installations throughout the states of AL, MS, and TN in the southeast area. Contact us via email at info@bscsolutions.com or call us at 205.988.3300 to speak with a specialized sales representative. To get a better understanding of why the vertical technology is simply brilliant and to really wrap your mind around the flexibility and reliability of the industrial vertical lean lift download the Hanel Lean Lift Brochure.